Fast food workers have been conducting one-day strikes for better wages and working conditions in several American cities. They’ve also been doing much more than that: They’re shown the entire country real leadership. They’re fighting for all of us, and their fight is our fight. We can choose to see that, or we can ignore this struggle and continue our slow economic decline. It’s up to us. Workers at McDonald’s, Popeye’s, Taco Bell, and Long John Silver, most of whom earn the federal minimum wage of $7.25, are asking for an increase to $15 per hour. That’s exactly what they should do. It robs workers of their dignity and their rights – “life, liberty, and the pursuit of happiness,” remember? – to ask for anything less than a living wage. And the current minimum wage is not a living wage. In fact, if the minimum wage had kept pace with inflation, it would be more than $16 today. These fast-food workers have pitched their wage request exactly right. What’s more, corporations like McDonald’s can easily afford it. McDonald’s makes a perfectly acceptable profit in Australia, where the minimum wage is $14.50 and workers just negotiated a 15 percent raise. Its profit margins are very high – 19.82 percent in 2012, compared with the consumer services industry average of 4.9 percent – which means that greed, not the desire for a decent return, is why it underpays its workers. The fiscal argument for raising these workers’ wages parallels the argument for raising the national minimum wage. Most minimum wage workers work for large corporations, and large corporations are making historically high levels of profit. What’s more, by keeping millions of their workers below the poverty level, these corporations are draining the public’s coffers whenever the government is forced to step in to provide Medicaid, food stamps, and other supplemental assistance. Funny how many corporate CEOs tell us the federal deficit is “urgent,” then suddenly disappear when this issue is raised. But in another, very real sense, even the fiscally-based argument which I just used is morally off-base. While its fiscal points are all correct, the balance sheets don’t need to add up to change the fundamental truth: It’s immoral to pay people less than a living wage for full-time work. And we know that McDonald’s wages are less than a living wage. The corporation proved that itself with its ill-conceived “financial planning” exercise for employees. Arguing that corporations “can afford to pay decent wages and still be wealthy,” as I just did, ignores the greatest ethical problem: Wages which can leave households in poverty, even with full-time work, are as immoral today as indentured servitude was in colonial times. This nation didn’t abolish indentured servitude because our moral leaders reviewed the books of the Virginia Company and the great Southern plantations and decided that their bottom line could handle it. We abolished indentured servitude because it was wrong. Our consciences wouldn’t allow us to continue the practice. They shouldn’t allow us to treat fast-food workers this way, either. They tell us that fast-food employees are young people who don’t need the money. But that argument merely ghettoizes these workers, more than a quarter of whom are raising one or more children. In that sense they reflect the entire minimum-wage workforce: Only 16 percent are teenagers, most are women, and collectively they’re raising more than seven million children. It’s an old trick, this ghettoizing of workers we don’t want to pay. In fact, it’s as old as slavery. It’s as old as the building of the railroads, back when laying down tracks was “Chinese people’s work.” It’s as old as the days when teachers didn’t need a living wage because teaching was “women’s work,” and women only did it until they found a man to marry them. As with those jobs, turning employees into the “Other” is a way of dehumanizing them. No human being, young or old, should be forced to work for inadequate wages. They shouldn’t have to work in inhumane conditions, either. But workers at a McDonald’s in New York City’s Washington Heights chose to strike because they were forced to work without air conditioning in sweltering July heat. Some of them became physically ill before their colleagues finally walked off the job, demanding that the air conditioning be repaired. The same thing happened at a Dunkin’ Donuts in Chicago, where workers in a West Lake Street shop walked out after repeated requests to have the air conditioning repaired were ignored. That’s inhumane, at any age. Sadly, the fate of low-wage workers, especially those who work in retail sector, is increasingly that of the American workforce. Job growth in this country is deeply inadequate, and far too much of it has come with the wrong kinds of job: retail, low-paying, and part-time. We should demand that more be done to create well-paying jobs. But we also need to make sure that every job in this country pays a living wage. Those on the right who argue otherwise are trying to have it both ways: On one hand they tell us that, thanks to “structural changes,” all the good jobs are gone. But they also tell us we shouldn’t expect a survivable income from the jobs that are left. That’s a recipe for mass tragedy. Fortunately, both of their assumptions are wrong: We can have good jobs in manufacturing and other sectors, and we can earn a decent living from minimum-wage jobs too. The fight for both – good jobs and a higher minimum wage – is a fight to improve the economy for all of us. Economies don’t grow by trickling down from the rich. They grow from the bottom up, as lower-income people improve their standard of living and increase the consumption of consumer goods. They also grow from the middle out, as the middle class is once again able to spend its way into a better life – for itself, and for everyone. These fast-food workers should be celebrated for their courage. They began their actions without the benefits of union membership or the support of organized colleagues around the country. That’s not an accident. Our increasingly corporate-dominated political process has systematically weakened the rights of workers to organize and work toward their own best interests. As a result we’ve seen an erosion of many other workplace rights, too: The right to healthy working conditions. The right to a decent income. The rights of privacy. Even, in some cases, the right to go to the bathroom when necessary. Fast-food workers are frequently the front-line for new attempted assaults on employee rights. A case in point was McDonald’s recent attempt to force employees to receive their payments using ‘payroll debit cards’ that provided banks with large service fees. A minimum-wage worker was forced to lose a half-hour’s pay just to cash their paycheck. This company-store move was beaten back by employees’ objections. Now they’re fighting for better basic wages. So while we celebrate these employees for the bravery of their actions, we should also rededicate ourselves to restoring workplace rights. That effort begins by restoring the right to organize, unionize, and demand change. 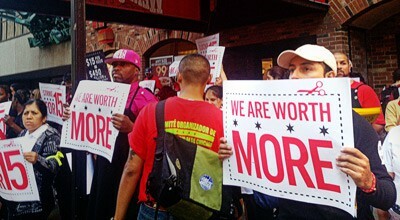 In a very real sense, these fast-food employees are fighting for all American working people. From debit-card charges to working conditions to a living wage, it’s not rhetoric or metaphor to say: Their fight is our fight. They deserve our gratitude for taking the first step, and they deserve to have us walking beside them in the steps yet to come.